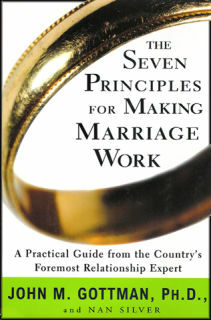 So, I just finished reading The Seven Principles For Making Marriage Work by John Gottman. I know I can't believe I just finished reading another relationship book. Crazy! This book was awesome! It has all kinds of little quizzes that will show you areas of your marriage that you may be weak or strong in and it gives tons of suggestions and ways to improve on those weaknesses and strengths. This is one book everyone should read or at least have on had as a reference.